Swing is the thing on the first two tracks. The opening number, Cole Porter‘s “It’s All Right With Me”, was co-arranged by her pianist Rich Eames and moves at full throttle. It’s a fun and fast interpretation, yet still very pronounced and coherent. The same can be said about “I’m In The Mood For Love” which opens with only bass accompaniment from Lyman Medeiros. The fancy arrangement by Dori Amarilio also features a melodica solo courtesy of Andy Langham. A nice feature. For the very first time, here’s a great version of “You Can Leave Your Hat On”, the Randy Newman tune which for me is forever associated with Joe Cocker whose version I never liked. But the funky arrangement here which was written by Steve Tyrell musical director Quinn Johnson, is dead-on and pretty cool. I really like her Latinized version of “Wild Is The Wind”, full of drama and wit and showcasing Dolores as a fine storyteller. Just in time for the upcoming spring season, she also delivers a lively, compassionate “Here Comes The Sun”. The George Harrison tune gets a very strict, urgent treatment with a soulful backing vocal arrangement and some superb playing by guitarist Larry Koonse. On this particular track, Dolores’ wonderfully striking voice and clear and direct intonation has won me over from the very beginning. But she’s equally at home with the ballads: the gloomy story behind “In My Solitude” is told with just about the right amount of misery and melancholy that is really haunting. Her aspirated “bring back my love” speaks volumes. Dolores’ Mexican background is at the front and center of “Tequila”, added as a short, percussive version with new lyrics by Mark. I wonder if it makes any difference if it’s about a white or brown Tequila. Always a welcome change of pace and style is the art of Dave Frishberg whose own “A Little Taste” is captured with finesse and a certain dose of Susannah McCorkle-ness. Her phrasing on “Harlem Nocturne”, the 1939 standard written for the Ray Noble Orchestra, is excellent. 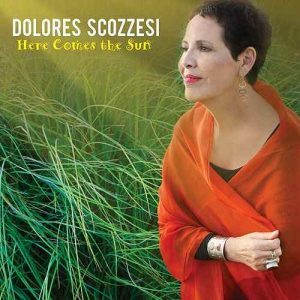 There’s the melodica again, complementing Dolores’ wonderfully modest, yet authoritative approach which is wrapped up in another enchanting arrangement by Dori Amarilio. ginalovesjazz.com – the jazz magazine by matthias kirsch Copyright © 2019.